Cut. Chisel. Scrape. Saw. Sand. Creating subtractive sculptures out of Styrofoam floral is fun, easy, and inexpensive! This is a great project to explore abstract or non-objective design as well as leaning about positive and negative space. Student’s can be challenged to incorporate texture or other elements/objects into the sculptures as well as seen in this foam sculptures by a student at Nicolet High School. Objective: Learn and practice subtractive sculpting and modeling techniques used by sculptors (scraping, cutting, chiseling, sawing, sanding). Demonstrate good craftsmanship by creating a non-objective subtractive sculpture inspired by sculptors Isamu Noguchi & Henry Moore. Students will symbolize an emotion through form, line, shape and color. They will use subtractive sculpting techniques to define an abstract or non-objective form. Subtractive sculpture involves the removal of material from a block – through cutting, chiseling, chipping, or scraping away. Wood carving, stone or plaster sculpture are the main sculptural processes which are subtractive. Other Subtractive Materials: Clay, Chalk, Plaster, Wood, Soft salt blocks, Artificial Sandstone, Soap, Wax, etc. Subtractive sculpture is the oldest form of sculpture. 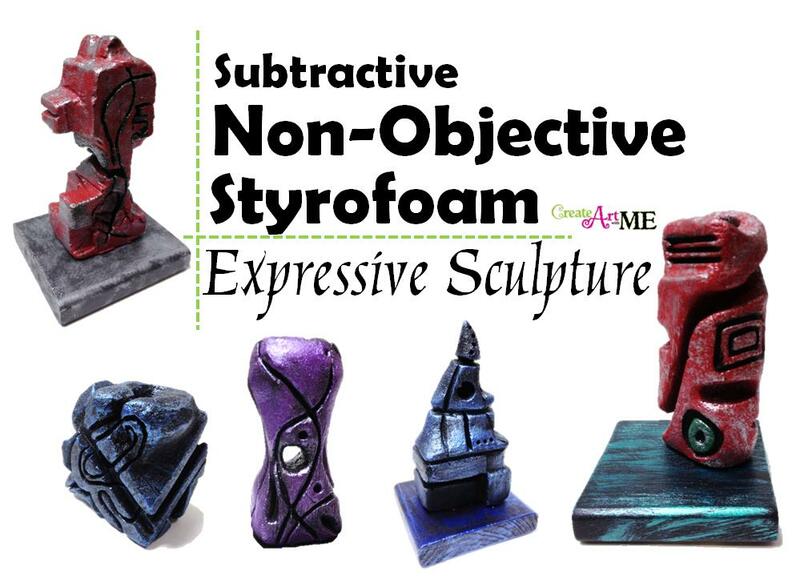 Project Objective: Create a non-objective sculpture using subtractive methods. Design a sense of movement by manipulating form, and expressing an emotion through the use of color. Use rasps to mold & shape your sculpture. Use sandpaper to get it really smooth. Coat entire sculpture with glue. Paint with acrylic paint a SOLID Color first. Use the Dry Brush technique to brush on a darker value or metallic color to help exaggerate the crevasses or metallic sheen. Paint base with acrylic paint. Attach sculpture to base with glue. In sketchbooks, students are to work on 2 thumbnail sketches for their Styrofoam Block sculpture design. What to do with ALL THAT GREEN DUST: throw it in the trash-NEVER blow it in someone’s face!! Use a bristle brush to brush the green dust into your tray, then into the trash can. Remember to carve large areas in SMALL chunks! If you try to cut away a large block to quickly it will most likely break off! How to cut holes in the foam without breaking the design. If you accidentally break a large section off, DON”T THROW IT AWAY–use wire to attach it (may require some redesign of your idea). **Finish sculpture by coating it with glue (let dry). Paint with black acrylic paint, then dry-brush paint over the black with metallic acrylic paint. Hi Melissa, We used regular Elmers glue that we diluted a little bit. Does the Elmers glue keep the foam from absorbing the paint? Yes, the glue does 2 things: It locks in all the foam particles and prevents them from getting in the paint and second it creates a smooth solid surface for the paint to adhere to. Do not skip this step! These look fantastic! Love this idea.